Prototyping the Past: the Maker Lab in the Humanities at the University of Victoria | What Is A Media Lab? We prototype the past by prototyping absences in the historical record. That is, we remake technologies that no longer exist or function like they once did. The technologies we prototype are dated anywhere between the 1850s and 1950s, which give us a sense of media history prior to personal computing but after early feedback control and related mechanics. These prototypes usually inform present-day technologies — wearables, cloud computing, and optical character recognition, for example — by giving them a sense of texture and change. How did these technologies become those technologies? Who contributed? Who got credit? Who was ignored? What materials were used, and when? Who or what was deemed innovative or obsolete, and under what assumptions? Did old stuff actually work how people said it did? How might we better understand materials such as early patents, illustrations, advertisements, journals, and even fictions by remaking objects depicted in them? To remake things, we use a combination of media theory and archival work with 3-D modeling, fabrication, physical computing, and design studies. In practice, this process includes frequent iteration. We move back and forth between conjecturing and testing, or — in terms of media — between 2-D and 3-D, page and screen, bits and atoms. The MLab is a research space. Everyone who works here is either a faculty member or a research assistant, representing departments and programs such as English, Visual Arts, Electrical and Computer Engineering, and Cultural, Social, and Political Thought at UVic. We occasionally offer free workshops for students, and each year a few of us teach physical computing and fabrication at the Digital Humanities Summer Institute. Our lab work has influenced how we teach and study, too: UVic courses on “Prototyping Texts” and indie games, for example, as well as experiments with type, forms, and bots. Put this way, the boundaries between the lab, classroom, archive, and broader community become rather permeable. We haven’t patented anything, but we share our work through journals, exhibits, repositories, conferences, books, zines, and maker.uvic.ca. We spend most of our time on a project called “Kits for Cultural History,” and document our research online. Each Kit prompts people to reverse-engineer and remake a particular technology (e.g. 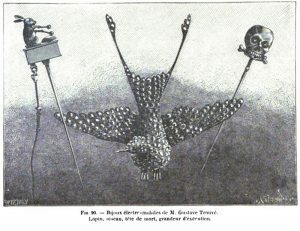 an electro-mobile jewelry from 1867 Paris). Kits include physical components for assembly, containers to house and arrange the components, repositories of files (which we publish on GitHub), zines or guides for interpreting the history at hand, and journal articles or book chapters containing related scholarship. For the journal, Hyperrhiz, we published a piece on the Kit as a concept and technique, inspired in part by Fluxkits. With that publication, we also displayed a Kit at Rutgers University-Camben, for an exhibit titled, “Kits, Plans, Schematics” (curated by Helen J. Burgess and David M. Rieder, with Jim Brown and Robert A. Emmons Jr.). 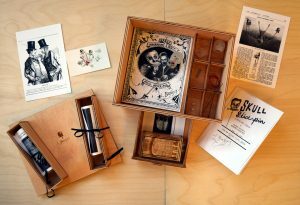 There, we suggested that the core ingredients of a Kit for Cultural History are a box, prototype, model, and supplement. Instead of starting with a program (or theory), supporting it, and ultimately proving it, these ingredients present a collection of positions and possibilities for negotiation across digital and tactile media. The “Early Wearables Kit” is a good example. We have two modest spaces on the UVic campus: a modeling and prototyping lab in the Technology Enterprise Facility (TEF) and a fabrication lab in Visual Arts. The TEF space is dedicated primarily to computer work, including physical computing, programming, and scanning. We also hold meetings there, and we co-author publications in that space, too. The Visual Arts space is for work with hand tools as well as various types of machine work: laser cutting, printing, milling, and routing. If we are reconducting historical lab experiments (e.g. magnetic recordings on piano wire from 1898), which we often do for the Kits project, then we use the Visual Arts space as well. This existence in two spaces, across two faculty (Fine Arts and Humanities), really enriches our research. When combined, the two environments profoundly shape how we practice and share media history. Since 2013, our infrastructure has been supported by the Canada Foundation for Innovation (CFI) and the British Columbia Knowledge Development Fund (BCKDF). Aside from infrastructure support from CFI and BCKDF, our research is supported by the Social Sciences and Humanities Research Council of Canada, in collaboration with Bill Turkel at Western University. The Departments of English and Visual Arts at UVic also support our everyday work. We have a lending library in the MLab. It’s filled with various sorts of texts, from media history and critical theory to artists’ books and guides to electronics. As the library suggests, we operate somewhere at the intersection of experimental media and comparative media studies, with a touch of science and technology studies here and there. Work by Wendy Chun, Tara McPherson, Anne Balsamo, Kari Kraus, Tara Rodgers, Beth Coleman, Anna Anthropy, Matthew Kirschenbaum, Susan Leigh Star, Paul DeMarinis, Sara Hendren, Lisa Nakamura, Lauren Klein, Nicolas Collins, Alexander Galloway, Fred Moten, Hannah Perner-Wilson, Allison Parrish, Matt Ratto, Lisa Gitelman, Garnet Hertz, Bethany Nowviskie, Karen Barad, Jonathan Sterne, Donna Haraway, Johanna Drucker, Carl DiSalvo, Walter Benjamin, Leah Buechley, Anthony Dunne, Fiona Raby, and Daniela Rosner often comes up during conversations as well as in our publications. It’s nothing new, but our theory is that you cannot separate culture or expression from matter or materials. To experiment with matter is to experiment with culture, or to talk about expression is to talk about materiality, too. Media may not determine our situation, but they are certainly entangled with it. Technologies may not be autonomous, but we are not in total control of them, either. Ultimately, then, we are interested in media as matter, mechanisms, discourse, values, and labor. That’s a lot. Still, it demonstrates how media are contingencies all the way down. Our most significant accomplishment has been developing the notion of “prototyping the past” through both theory and practice. We published material on this approach (e.g. in Visible Language), but the gist is that prototyping may be treated as a negotiation or situation for interpretation, as opposed to the creation of exact replicas or reproductions of history. Prototyping the past is prototyping as inquiry, with an emphasis on what’s missing from collections at hand. Here, we’ve learned a lot from collaborations with Kari Kraus, Bethany Nowviskie, Daniela Rosner, and Bill Turkel. Our next step is to co-author and co-design a book tentatively titled, A Practical Guide to Prototyping the Past. Right now, it’s somewhere between a zine, comic, and artists’ book. We are writing it for a general audience interested in combining historical inquiry with modeling and fabrication, but there will be theory and conjecture everywhere, too. The MLab is culture first, technology a close second. We could say we’re a lab because we have a bunch of computer numerical control machines, or because we rely heavily on trial-and-error methods for rapid prototyping and design. But we’re a lab because we are a group of people conducting experiments together, and across the arts and humanities we rely on each other to learn and communicate our research. None of us is an expert in all the things, and there’s no authoritative lab model or text to provide us with answers to our inquiries.